Makes learning the truths of Proverbs fun and memorable and will point children to the true wisdom that is only found in Christ. Parents would like their children to “wise–up.” They know that wisdom will keep their children going in the right direction as they face all of the challenges of life. So Christian parents through the centuries have taught their children from Proverbs the godly wisdom needed to navigate the many choices we all make every day. 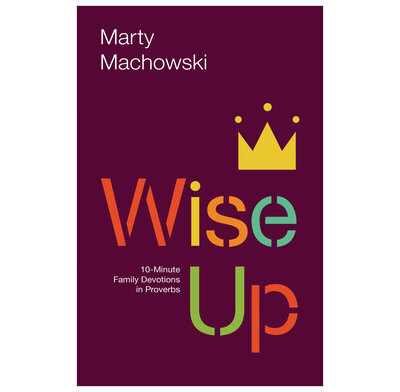 Marty Machowski, father and family pastor, knows how important it is for children to be pointed to the right path, so he has created a devotional resource with twelve studies. Using the popular and easy–to–use “ten–minutes a day” devotional approach from Long Story Short and Old Story New, parents will be able to help their children grow in wisdom and learn how to live a God honoring life. But this resource doesn’t just give children direction for life’s choices. It moves beyond the practical wisdom of Proverbs, to connect the teaching of Solomon to God’s larger story of salvation. Children will compare the life of Solomon with the life of Christ to see that Jesus was greater in every way. Solomon’s wisdom, life, and failures all point to “something greater than Solomon”–they point to Jesus. The goal of this family devotional is to present the wisdom of Solomon against the backdrop of the gospel to show children that real wisdom comes only as we depend on Jesus for daily help and forgiveness. Each five–day session includes Bible reading, discussion questions, a fun activity, and songs for families. Wise Up will help make learning the truths of Proverbs fun and memorable and will point children to the true wisdom that is only found in Christ.